It must be 4 pm for the United States of America with tea parties in full swing and the Republican party is running around with wheel chocks to keep them cannons on deck. Joe Miller up in Alaska doesn’t just want to gut Social Security like most Republicans–he thinks Unemployment Insurance is UnConstitutional! After all, why should we have to pay for those lazy slobs when they could just pick themselves up by the bootstraps and get a job–in India, where so many of our jobs have been outsourced. You think they’d paid MONEY into that so-called insurance. There goes a man who’s never had to worry about his next meal. Funny how that kind of person always knows what YOU should do in a situation they’ve never experienced. Lisa Murkowski, the incumbent he beat out of the primary, may run as an independent. Then there’s Sharon Angle in Nevada. You know, the one that thinks the Second Amendment gives us the right to an armed insurrection if we think the gummint has turned tyrannical? She evidently parses that out from “a well regulated militia being necessary to the security of a free state.” I wonder what was in the Founder’s coffee THAT morning! She’s also said that the citizens of Nevada need to “take out” Harry Reid and she didn’t mean for dinner. As all people who speak without the intervention of brain cells, she had to retreat from this statement and explain that she meant they had to take him out OF OFFICE. Fine, Sharon, but please, try passing your words through that space between your ears next time. Then there is our latest darling, Christine O’Donnell. The winner of the Sarah Palin look-alike contest who dated Satanists in high school before becoming a professional Christian. I guess the ability to spin on a moral dime — or on an unholy altar! — is considered a plus in tea party circles–except when it isn’t! So far, the established right has harped on her financial problems and, shall we say, the alleged creative use she’s made of campaign funds to help allay them, but her views on self-gratification have always been right on the spot! That one–there–no, there–yes, mmmmmmmmm. PUNISH ME GOD! The problem is that American cannot laugh off these tea partiers, no matter how crazy they seem, because some of them are going to be elected. The Republicans might be trying to keep them in the fold, but they aren’t herding sheep, they’re trying to herd cats, and if you’ve ever tried to get a cat into the carrier to go to the vet, you know exactly what I mean. While they might seem laughable, so did a bunch of weirdos that dressed like overgrown boy scouts in Weimar Germany. The good thing about the tea party is it has no leadership, not even Glenn Beck, no matter how hard he tries. The bad thing is that someone WILL come along who understands how to play to it. And that’s when I visit my relatives in Canada for an extended stay. In other news, I have debuted a collection of my cartoons from the Bush era. 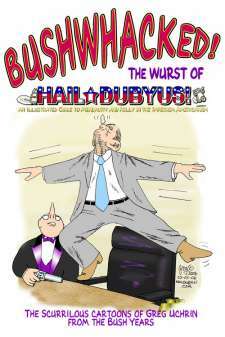 BUSHWHACKED: The Wurst of HAIL DUBYUS! appeared for the first time at InterVentionCon last weekend and is 80 pages of high quality reproductions of some of my best Bush era cartoons from the original 300 DPI files. 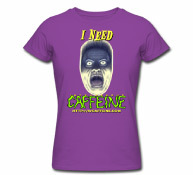 I’ll be hawking it at other cons throughout the year, but you can buy it at IndyPlanet. 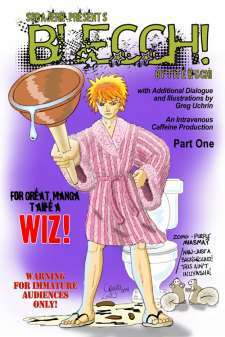 This blog is not commercial–I’ve been doing it out of a sense of “doing something” to make a difference–so please take a look and help defray the costs of my artistic and satiric endeavors If you’re ever at a comics convention where I’m appearing, I’ll be happy to sign your copy!